On the new year's day, an Ekal supporter walked in EVFUS office and donated $ 1,00,000 anonymously for sponsoring ekal schools for 5 years. This was regarded to be a New Year's gift from the Almighty. Sri Ramesh Shah has resolved to travel extensively this year to meet Indian Businessmen, HNW Indo Americans, professional millionaires and others to explore avenues to generate maximum funds. 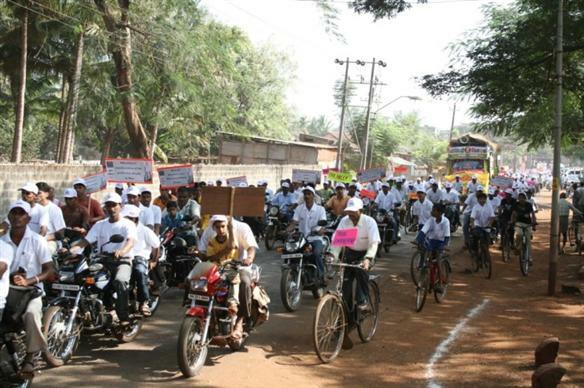 An Ekal Rally was organized at Belgaum on 10th of January, 2010 on the eve of Swami Vivekanand Jayanti. 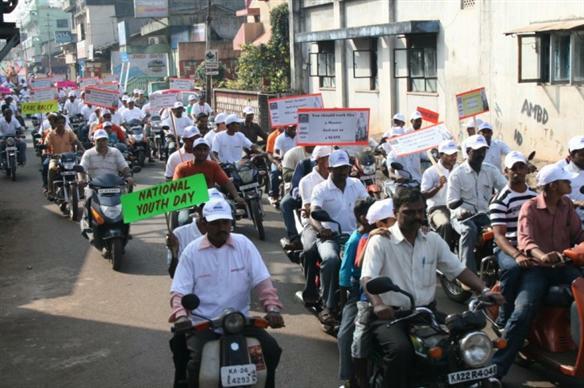 About 600 people participated in the Rally who covered about 13 Kms on major roads of Belgaum on bicycles and motorcycles. 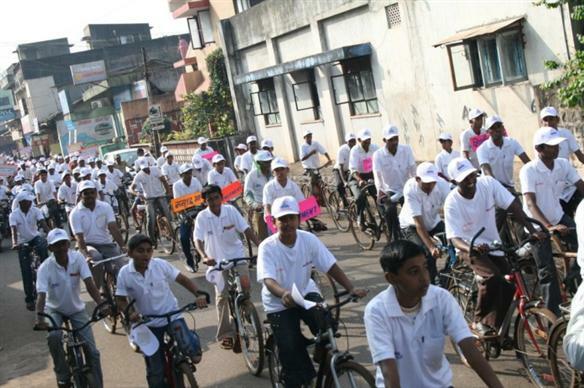 Earlier, Pamphlets and Swami Vivekanand's photos were distributed in the area. 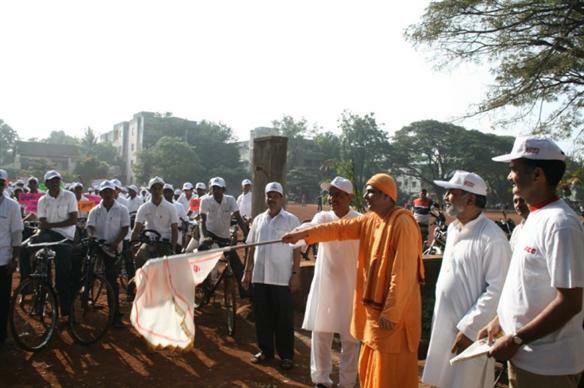 Swami Atmaprakashanand of Ramkrishna Mission Ashram, Belgaum inaugurated the rally.15 Yojana Karyakartas were felicitated at the hands of Swamiji. 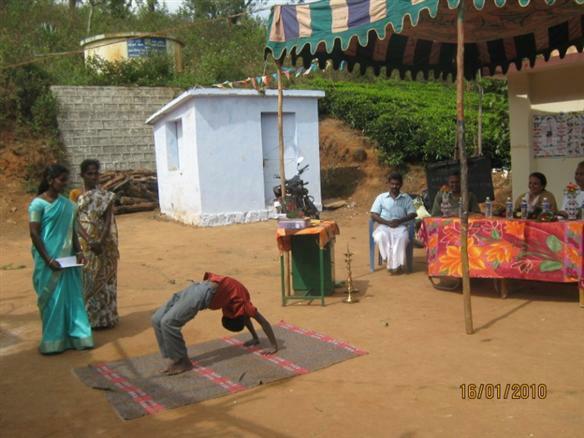 The Swalamban Prasikshan Kendra of Tamilnadu is coming up in the village Vanduvancherry near Kumbakonam in Tamilnadu. 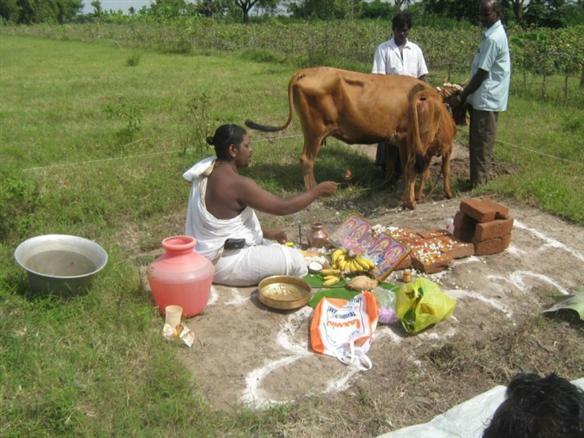 Before starting the basic construction work, it is the tradition to perform Pooja of the Mother Earth and Gomatha. The Pooja was performed on 25th of January, 2010. Sri M.Balasubramanyam, Vice-President of FTS Chennai & the Chapter Prabhari for SPK (CPB-S), Sri Raghavan & Smt. 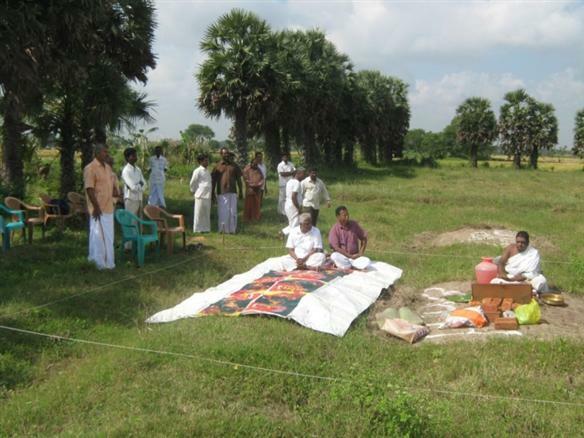 Aruna Raghavan (Both Educationists), Sri K.Kannan, President of the local committee with his team of local agricultural people were present on the occasion. Dr. C.Satheesh Kumar, Yojana Pramukh of the Gramothan Yojana spoke on the concept of Swalamban Prasikshan Kendra. 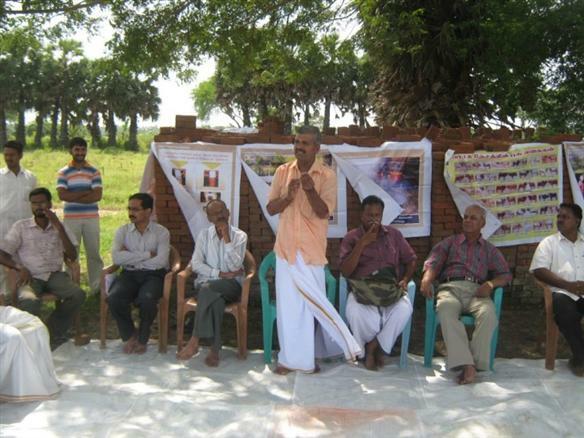 Sri Nammalwar, natural farming expert and an authority on natural farming in Tamilnadu was present on the occasion. He blessed the Swalamban Prasikshan Kendra and promised all support from his side. On 12th December, 2009 Sri Sudesh Agarwal, Scientist, Queerland Hospital, USA visited Ekal schools in Salegarh Upsanch of Raisen Anchal of Bhopal (MP). He was accompanied by Sri Satish Agarwal, Special Officer, Narmada Valley Development Authority, Sri Purshottam Sodhani, Organizing Secretary, Sri Sanjay Malviya, Incharge Bhopal Chapter and many others. 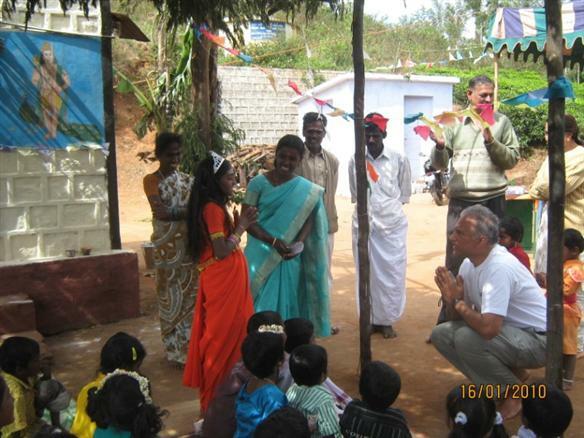 The visitors were given warm welcome by the villagers and school children. Sri Sudesh very much appreciated the performance of the students and resolved to continue his valued support to the Ekal Movement. 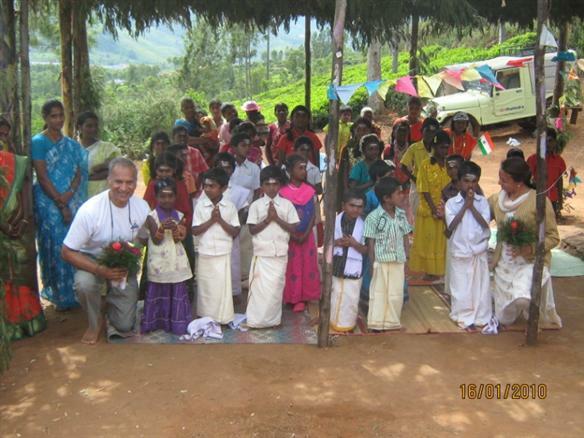 Mrs and Mr. Suresh Gupta from USA visited ekal schools in Shakti Nagar of Ooty Anchal of Tamil Nadu on January 16, 2010. They were spell bound by the performance of the children and assured their support for this noble cause.